I am sure most of you have heard about the bomb blasts that occurred in Delhi earlier this month causing massive damage and loss both in terms of life and property. One of the areas that was hit by the blasts was Connaught place (CP) and obviously after the blasts happened security has been tight around these areas to try to prevent another such incident from happening. I was in CP this weekend meeting with friends for lunch, we were walking about CP when we got the craving for an icecream so we found one of the road side vendors and purchased ice-creams. Now we had to throw the wrappers but couldn’t find a dust-bin (garbage can) next to the guy so we asked him where the garbage can was. His reply was that after the bomb blasts the cops have banned people from keeping garbage cans… (The bombs were hidden in the cans) We had to throw the wrappers in a pile of garbage that was stinking pretty badly under the upturned garbage cans. At first I thought he was joking, then we confirmed it with another vendor. He said that they are not even allowing people to keep small cardboard boxes next to their carts to collect thrash. They all had to dump it on the ground. I can’t understand the logic behind this. Yes they hid it in a thrash can this time, next time they might hide it in a waterbottle, or in a backpack. This is what I call security theater. There is no appreciable gain in security but it looks and sounds like the cops are doing something. A news story describing a successful launch of China’s long-awaited space mission and including detailed dialogue between astronauts launched on the Internet Thursday, hours before the rocket had even left the ground. To fix this issue you need to extract the upgrade zip file that you downloaded and then copy the SugarFields folder from the includes directory into the include folder of your CRM. Once you do that the CRM upgrade will continue normally. This one was an interesting one to fix. I had already migrated a couple of test installs on that server so I knew the server supported the upgrade script and I was migrating the same install again so I knew that the install could be upgraded. 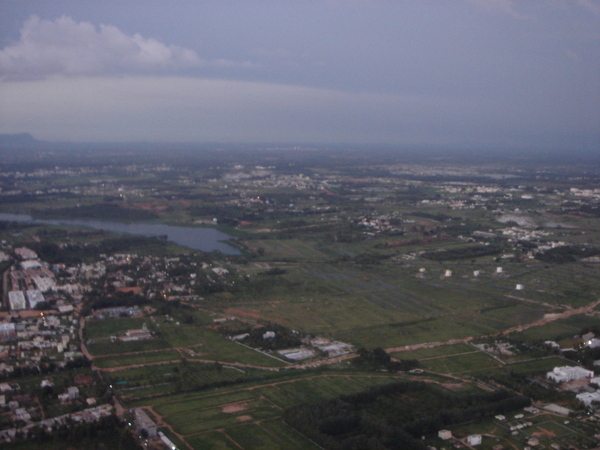 This weekend I flew down to Bangalore to fly a Microlight plane and celebrate Vinit’s birthday (but that’s another post). It was an awesome trip and I had a lot of fun. On Friday I left the office at about 1 am and my flight was at 6:45am and I had to get there by latest 5:45 which meant that I had to leave home at 5am as the airport is about 45 mins from my place (depending on traffic). Obviously I hadn’t packed the night before so I had to get up at 4 to pack which meant I had about 2 1/2 hours of sleep. I flew Kingfisher so the flight was comfortable and the food was decent. 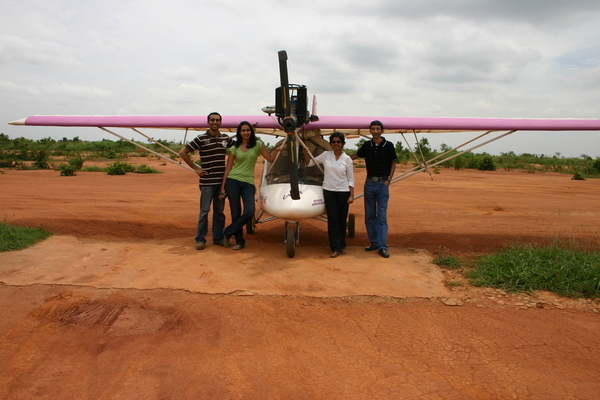 I got there at 9:30 am and Surabhi and Vinit picked me up from the airport and we went straight to the airport for the flying lessons. Surabhi and Vinit had both already done one session of 1/2 hour each before I got there. When I first went up the weather had cleared so the instructor let us stay up there for an hour instead of 1/2 hour as initially planned. 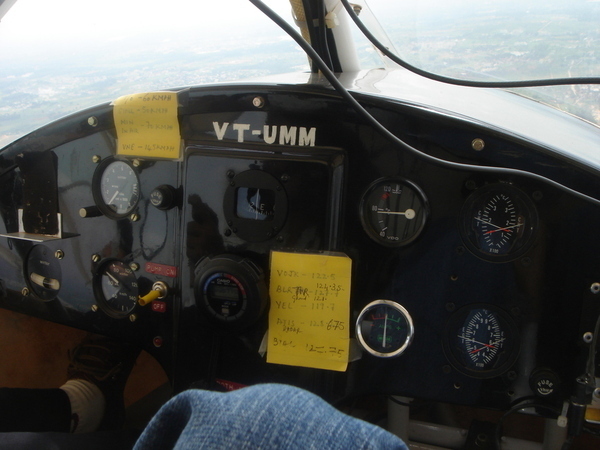 The visibility was very good and although the air was a bit turbulent it was good weather to fly. The plane we were flying can stay up for ~3-4 hours and go to a max height of 10,000 feet. We only went up to 1,500 feet though and were traveling at 80 – 90 km/hr for the most part. 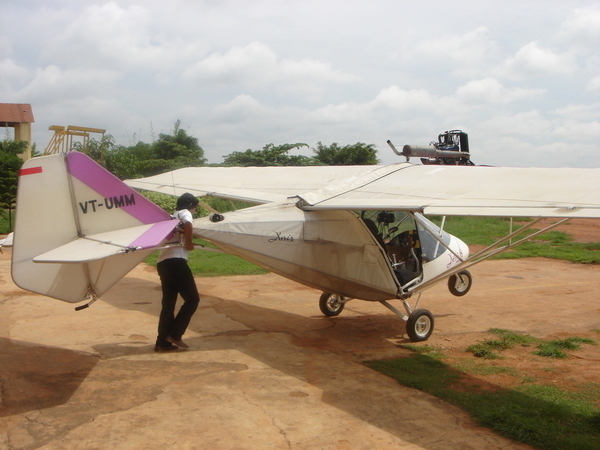 The plane is very light as you can see in the photo below where the pilot (Vinitha) is pushing it out of the hanger to prepare for launch. After the hour of flying we went back to vinit’s place and I crashed for a few hours. Then we drove back to the airport for another round of flying. My flight was the last flight of the day as no flying is allowed after the sun sets. I got to see the sun set from an altitude of ~1000 ft. It was an amazing view. The best part was that this time we took out the doors of the plane (which were made of pexi-glass anyways) and so we were at ~1,000 – 1,500 feet with no door between me and a free fall back to earth. Then we did a couple of sharp turns and believe me when you are up there at a 60 degree angle looking at the earth below through an open door it gives you a thrill like few other things can. 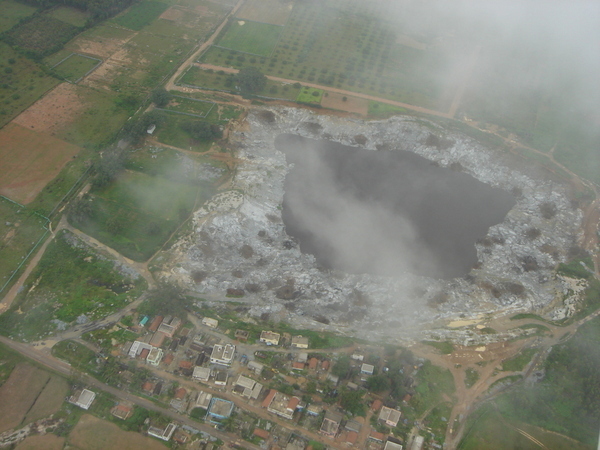 The view of Bangalore from up there was superb as you can see from the pic below. We finished our flying sessions with a last round of flying the next day. I was a bit worried that we would have to postpone the flight as it was raining earlier but by the time we got to the airport it had stopped. This time we flew through and above clouds which was also fun. Though I prefer to fly with a high visibility as its a lot more fun. I have about a gig of photos from the trip and I am in the process of sorting through them so expect to see some more pics in the photogallery sometime over the weekend. In India if you visit a Mall or movie theater they frisk you before they let you come in. They also check your bags for explosives/whatever before they let you in. 95% of the time I have been to either places they just check me from my shoulder to my pockets. I could be carrying a bomb strapped to my feet or in my shoes and no one would know. So how is it making me safer? Its just an additional hassle that I have to go through everytime I want to shop/watch a movie. Plus to make things even more secure, girls/women are not frisked. They get to walk in without any checks at all. So if I wanted to blow a bomb all I had to do was find a female crazy enough to believe that killing a bunch of innocent people was a good idea and I got the bomb in without issues. Now lets take a look at the bag check they have. I have gone to the mall a couple of times with my laptop, (No I wasn’t planning on using it there. I took it with me because I didn’t want to leave it in the car) and those of you who know me know what a mess I carry around with me (chargers for my phone, camera, laptop, bluetooth, My camera, couple of headsets etc) and I know its hard to figure out whats in there unless you know (like I do) or you take everything out and look at it. Every time I have taken it inside the guy didn’t spend more that 30 seconds looking through it. I could be carrying anything in there and they wouldn’t know. In-fact once while flying to NY from kansas I was asked what all I had in bag as the security people couldn’t make out what was in it. I had to tell them what all I had in there (Those days I had a blackberry, ipod with their chargers in addition to everything above) before they let me board the flight. So I know you can’t look through the bag in 30 seconds. So what does all this do? It makes people feel safer. The public sees something being done and is happy. The people in-charge can point to these measures and claim that they are taking actions to protect people. In reality nothing changes to reduce the threat. Second example: In the sector where I stay all cars leaving the premises after 10 pm have to be logged with the house no where the owner stays. This is supposed stop people from stealing cars from the sector. My question is simple: What is stopping a thief from saying he is from B-xyz and then happily driving away? Nothing. Is there some list where all the cars in the sector are listed? Nope. So the guard has to believe what the person driving the car tells them. So how does it make the sector safer? It doesn’t. What makes people safer is the guards patrolling at random intervals and the patrols. This check at the entrance is just irritating and of no particular use. Are there other examples of security theater? Absolutely. Though I am not going to go through all of them here ’cause that can fill a book. Stop being so scared people. If you act scared, they win. Live your life normally. Don’t let terrorists win. When I was in the US in 1999 I was told not to go to Times Square for New Years eve as it was a terrorist target. Guess what I went there and had a blast. If I had acted scared and not gone I would have missed a once in a lifetime experience (I am pretty sure I won’t be around for 2999 celebrations) and nothing would have changed. I am not saying don’t take basic precautions but there a difference in taking precautions and living scared. Don’t let them win. Three days ago one of my hard-drives decided it was time to stop working. The irony of the situation is that I was in the middle of backing up data off that drive when it stopped working. I was happily copying data from the disk to another system when I noticed that a couple of files weren’t copied because of read errors. At first I let the copy continue, then I thought let me run a disk check on the drive first and then I can copy data off. Bad Move. Once I unmounted the drive none of the tools would recognize it and I couldn’t access any of the data on it anymore. I tried to make a disk image of the drive but even after letting the process run for 2 days it had only imaged 16 MB (The drive was 80 GB) so I cancelled it. If I had let the copy process run I guess I could have copied most of the data off it before it failed. Now I can’t even get the system to identify the drive. I have a backup of most of the data so its not critical that I get access to the drive but its a good learning experience. So I am going to try freezing the drive and see if that will let me get the data off. I will document my attempts and will share it over here over the next few days. Culture shock. What is it? Its been a while since I last blogged mainly because of work but another factor is that once you get home from a long day at work you just don’t feel like thinking and creating a coherent blog post, but I guess I should post a bit more regularly. I was reading Shipra’s blog and she has a post over there about culture shock that got me thinking: What exactly is culture shock? In my opinion its just a catch all term that covers all the differences between the culture you are from and the culture you are encountering. This can be as small as finding people driving like sane people instead of drug fueled crazies playing carmagedon and as big as finding women walking around barely clothed (on any US/European beach). Thanks to the global media and the internet the world is a lot smaller and there are lesser number items that could cause shock. Usually its not the big things that strike you, its the small things. As some of you might know I went to the US for my bachelors in 1999 and was there for ~8-9 years. People asked me if I felt culture shock and my answer to that is yes there was a period of adjustment and you can call it culture shock. Just to give an example, in India its considered extremely rude to call an elder person by their first name but in the US its common and expected. Infact I have been told to stop calling people sir/mam because it made them feel old. Another example: In the US if you are good friends with a person you hug them when you meet them, it doesn’t matter if the person is a girl and you are a guy. Infact its expected. While in India this wasn’t the case (Now it has changed and this is a common practice. But 8 years ago it wasn’t the case) I remember being a bit uncomfortable with it when I first went to the US and then when I came back I had gotten used to it and attempted to hug a good friend. She very nicely reminded me that this wasn’t the US.. Now whenever we meet we hug each other. Office manners differ a lot in the US and in India. In the US you call everyone by their first name no matter what their post is and how much above you that person might be in the hiearchy. In India you call your seniors ‘Sir’. The environment is a lot more formal compared to a similar company in the US. Even in the US there is a difference between offices on the East coast and the West coast. The west coast offices (I have only seen offices in California) tend to be a bit more relaxed and easy going while offices on the east coast (Again, only seen New York and New Jersey Offices) are a bit more strict (as compared to the west coast). Clubbing is completely different in the US, you can’t go to a club dressed in Jeans and sneakers, you have to wear shoes and trousers (semi-formal/khaki’s etc). In India I have gone to a club in Jeans and T-Shirt. The way you dance is also very different and the dance eticates are completely different. Recently we had our office anniversary party and after the party me and a friend were discussing the party (Basically making fun of everyone who was too drunk to know what they were doing) and she made a comment about one of my co-worker’s who was asking all the girls to dance a bit too enthusiatically and she said that a couple of the girls were uncomfortable with that as he was acting too familiar with them. I was surprised and didn’t really say anything at the time but afterwards I was thinking that I didn’t find anything wrong with the way he was behaving. I guess it was because I had gotten used to the way people behave in Clubs in the US and for me it was normal behavior in a club. So is culture shock real? Is it really that big an issue? Depends. On where you are from and where you are going. A person from the middle east will have a major culture shock when they come to the US while a person from France might not have that big of a shock. What are your experiences with culture shock? Do share.